So here's my 2018 in review post, a month late than pretty much everyone else's. It's going to feature less technical and job-related things and more personal and emotional journeys. The story had started in 2017 when my application for British citizenship was declined because they requested more documents and I happened to be out of the country at the time, so I didn't even get the request. That resulted in them automatically declining it because I, according to them, ignored their letter. I briefly consulted with my lawyer and sent Home Office a request for reconsideration of the result of the application. That was 26th September. Fast forward to March 2018, when I received another letter from the Home Office, in which they informed me that they started looking into my appeal, a mere 5 months after I sent it along. June (or July) rolls along, I get a new letter, in which I'm informed that I am granted the citizenship! Woop! And that the local council will get in touch to arrange for the ceremony. The ceremony was on 23rd August where I had to sign some papers, repeat a pledge, and optionally take a photo with the Lord Lieutenant. 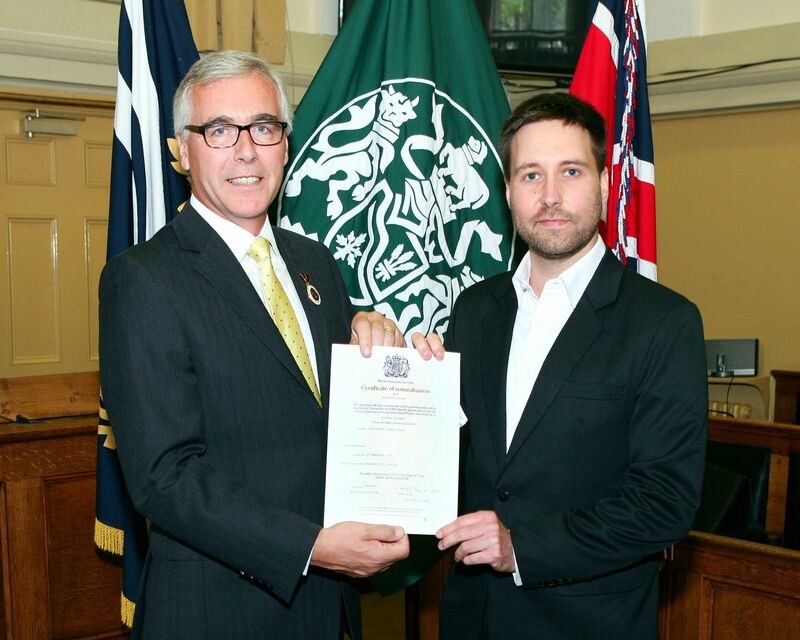 Myself with the Deputy Lord Lieutenant at the Citizenship Ceremony holding my certificate. And since then I am a British-Hungarian dual citizen. Shortly after I got my citizenship, I wanted to travel. I pretty much grounded myself after I got back from my travel in 2017 not to miss any letters from the Home Office. I picked Portugal, mostly because my previous visit there had been cut short, and because at the end of the year it was still hot enough for me to finally surf. I had trouble standing up on the board though, my back felt like it was locked, and at one point I cried out in pain. My instructor told me to get out of the water and stretch some more, and possibly have it checked out by a doctor before I get back into anything physically taxing. I decided to call it a day then. When I got home, I pretty much just ignored that for a while, partly because an appointment with my GP would have taken 4 weeks at least. One day I went to sleep with mild pain. By the morning, it was substantially worse, so I got on the triage list. A doctor saw me the same day, then asked me if I can get to a hospital, and if so, they're waiting for me at the JR emergency surgery unit. I might have appendicitis. Got some blood tests, an x-ray, a CT scan, then I went back the next day for another CT and an ultrasound. The good news is that it wasn't appendicitis. The slightly less good news was that I have a lump behind my stomach that's not supposed to be there, and some spots the ultrasound revealed that also weren't supposed to be there. More than likely it's malignant. Long story short, I was very quickly scheduled surgery, a bunch of meetings with specialists and consultants, had to do a bunch of admin, and ... that's how my 2018 ended. Three cycles of BEP chemotherapy began on 6th December. I'm currently, as of writing this blog post, on day 2 of the last cycle. I was also hospitalised during my first cycle, which wasn't fun, but at least I got to go home by Christmas. February 7th is the last day of my chemotherapy. I have a CT scan on the week of 18th February, then a meeting with my consultant on 4th March. That should be the end of it if all goes well. There's a chance I may need some additional attention, depending on the outcome of the CT, but let's cross that bridge when we get there. I want to go on a 4-month Remoteyear trip, but with upcoming control CTs, it might not be a possibility for a while. Instead, I might just visit places on my own, one month at a time, where I can fit them in. It's only mildly infuriating because my work situation had allowed me to travel wherever I want to for the past 5 years and I couldn't; first due to the citizenship requirements, and now having to be present for cancer treatments. One of my goals for 2018 was that I'd learn Go. With everything that went on, I failed that one (plus a few others, like being published in a print magazine), however, 2019 should bring these back to the front. Currently writing an API in Go, and enjoying every moment of it. I haven't been able to actually do any work where other people depend on my constant availability, although hopefully that will also improve once 7th February rolls along. 2018 was more annoying than anything. I hope that in 2019 I will be less the puppet of my circumstances, and I actually get to do things that I want.